Edward FITZ RANDOLPH (1607 – 1675) was Alex’s 10th Great Grandfather; one of 2,048 in this generation of the Shaw line. Edward Fitz Randolph was baptized 5 Jul 1607 in Sutton-In-Ashfield, Nottingham, England. His parents were Edward FITZ RANDOLPH Sr. and Frances HOWES. He came from a titled family, see his father’s page for our Royal ancestors. In March 1630, he sailed with the great fleet of eleven emigrant ships assembled by John Winthrop from Groton, Suffolk out of London and landed att Naumkeag on the coast of Massachusetts on 13 June at what is now called Salem. Because Edward came from a titled family, perhaps he had passage on the flagship, the “Arbella” with Winthrop himself. The total count of passengers is believed to be about seven hundred, and presumed to have included the following people. Financing was by the Mass. Bay Company. The ships were the Arbella flagship with Capt Peter Milburne, the Ambrose, the Charles, the Mayflower, the Jewel, the Hopewell, The Success, the Trial, the Whale, the Talbot and the William and Francis. Edward married Elizabeth BLOSSOM 10 May 1637 in Scituate, Plymouth Colony. He died 1675 in Piscataway, New Jersey. 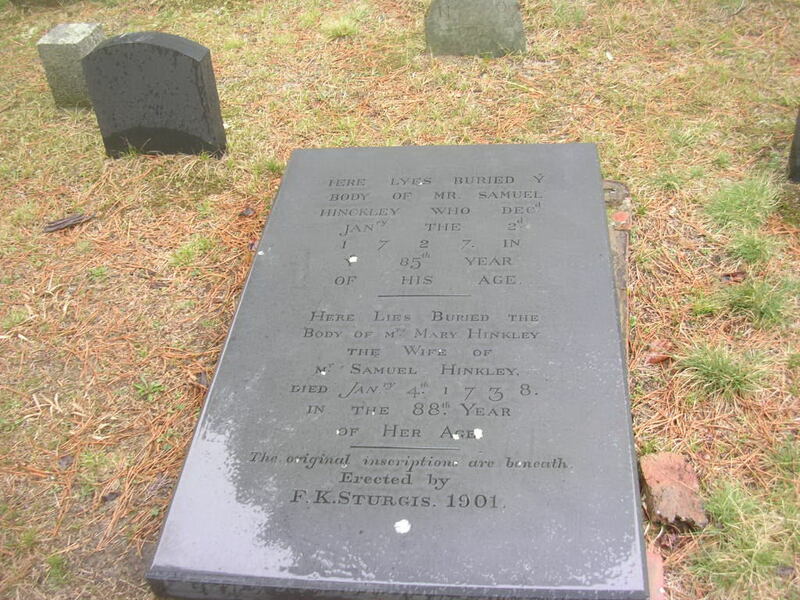 By tradition he is buried in the west corner of Saint James Churchyard in Edison, New Jersey with Elizabeth in northwest corner close to Woodbridge Ave. His tombstone is thought to have been destroyed when the British built breastworks for encampment. St James Church Edison New Jersey. Edward’s tombstone is thought to have been destroyed when the British built breastworks for encampment. Elizabeth Blossom was born about 1620 in Leyden, Zuid-Holland. Her parents were Thomas BLOSSOM and Ann ELSDON. After Edward died, she married John Pike on 30 June 1685.Elizabeth died in 1703 in Piscataway, New Jersey. Family tradition has her buried next to Edward, not her second husband. 2. Nathaniel Fitz Randolph bapt. 3. Mary Fitz Randolph bapt. Edward Fitz Randolph joined the Rev. John LATHROP‘s congregation in Scituate and moved with his flock to Barnstable. Lothropp gained prominence in 1624, when he was called to replace Reverend Henry Jacob as the pastor of the First Independent Church in London, a congregation of sixty members which met at Southwark. Church historians sometimes call this church the Jacob-Lathrop-Jessey Church, named for its first three pastors, Henry Jacob, John Lothropp and Henry Jessey. They were forced to meet in private to avoid the scrutiny of Bishop of London William Laud. Following the group’s discovery on April 22, 1632 by officers of the king, forty two of Lothropp’s Independents were arrested. Only eighteen escaped capture. They were prosecuted for failure to take the oath of loyalty to the established church. They were jailed in The Clink prison. All were released on bail by the spring of 1634 except Lothropp, who was deemed too dangerous to be set at liberty. While he was in prison, his wife Hannah House became ill and died. His six surviving children were according to tradition left to fend for themselves begging for bread on the streets of London. Friends being unable to care for his children brought them to the Bishop who had charge of Lothropp. The bishop ultimately released him on bond in May of 1634 with the understanding that he would immediately remove to the New World. Lathrop accepted the terms of the offer and left for Plymouth, Massachusetts. With his group, he sailed on the Griffin and arrived in Boston on Sep 18 1634. ” The young master Fitzrandolphe ” built in 1636, the 38th house constructed in Scituate. His house in order, Edward married Elizabeth BLOSSOM 10 May 1637 in Scituate, Plymouth Colony. He joined Mr. Lathrop’s church in Scituate May 14, 1637 and his wife joined at Barnstable August 27, 1643. The Congregation at Scituate was not a success. Dissent on the issue of baptism as well as other unspecified grievances and the lack of good grazing land and fodder for their cattle caused the church in Scituate to split in 1638. Edward sold his house in that town to Deacon Richard Sealis, and removed in the spring of 1639 to Barnstable, and built a house on his lot containing eight acres,bounded east by the road to Hyanis. Lothrop had petitioned Gov. Thomas PRENCE (wiki) in Plymouth for a “place for the transplanting of us, to the end that God might have more glory and wee more comfort.” Mr. Lothrop and a large company arrived in Barnstable, October 11, 1639 bringing with them the crops which they had raised in Scituate. There, within three years they had built homes for all the families. 1641: Edward serves as a juryman. 1643: Edward listed as able to bear arms in New Plymouth. 1 Jun 1649: Edward Fitzrandolphe sells his home to our ancestor John CHIPMAN and removed to his farm in West Barnstable ,”a double great lot” , containing 120 acres of upland, bounded north by the meadows, east by the Bursley farm, south by the commons, and west by the lands of Mr. Thomas Dexter. The deed of which is in the records at Barnstable. The land included eight acres, bounded on the north by the County Road, presently Route 6A, east by the Hyannis Road, extending across the present line of the Railroad (now extinct), south by the commons and on the west by the homestead of George Lewis Sr. The deed also conveyed a garden spot and orchard on the north side of the County road. In 1669 Edward Fitz Randolph, his family and several other families left their Barnstable home, for religious reasons and settled in East Jersey, near the mouth of the Raritan river, where he purchased from the Proprietary a large tract of land. Several of his older sons also taking up lands in their own right at the same time. At the time of Edward’s death in 1675 his land had not been surveyed. The Stelton Baptist Church in Edison, New Jersey was formed in the spring of 1689. 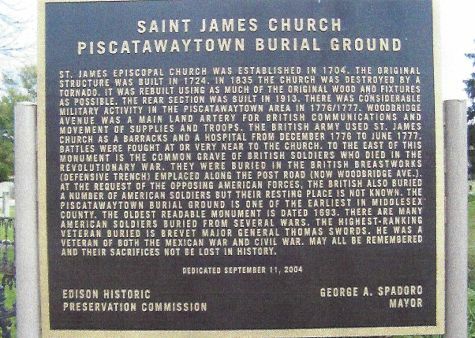 Until 1875, the church was known as the First Baptist Church of Piscataway. In 1870 portions of Piscataway, New Jersey and Woodbridge, New Jersey were used to form Raritan, New Jersey. The site of the church later became Edison, New Jersey. History of the First Baptist Church of Piscataway, Stelton, NJ 1889 BY Oliver B. Leonard Esq. The names of the first pioneers to settle on the Raritan were Hugh Dunn, John Martin, Hopewell Hull and Charles Gillman, with their families. On the 21st of May, 1666, they were granted the right as associates of the Woodbridge patentees, and December 18, following, were deeded by these New England neighbors from Newbury, one-third of their purchase obtained the week before. During the next year there came other members of the Gillman and Hull families, also Robert Dennis and John Smith. So cheerful were the prospects and complete the liberties established; so peaceful the plantation and so generous the inducements offered, that additional emigration soon followed by friends and neighbors of the original pioneers. Before the year 1670 passed, the settlement of Piscataway had been increased by many new arrivals of associate planters from New England. Among them were Francis Drake, Benajah Dunham, Henry Langstaff and John Martin, with their families, from New Hampshire; John Fitz Randolph, with his brothers, Thomas, Joseph and Benjamin, and sisters Elizabeth and Ruth, with their parents; Geoffry Manning, Nicholas Bonham, Samuel Walker and John Smalley, with their wives and children, from other New England districts, where the intolerance of the established Church order had restricted and restrained the exercise of free conscience and subjected them to many indignities and deprivations. But the required number of actual settlers had not yet purchased land in Piscataway and made such improvements as were contemplated and specified by the Woodbridge grant of 1666, and the previous charter of 1664 to the Elizabethtown colony. Four years had now intervened without realizing the necessary accessions to the population or the required development of the territory. On the 20th of October, 1670, Governor Carteret made a public proclamation waiving all objections that might be made against the Piscataway settlement “on account of their not having come in exactly according to the time limited.” Stimulated by this official concession, renewed efforts were immediately made resulting in the greater improvement of the country and an increase of emigration thither. By 1675-6 Piscataway had attained a notable prominence in the civil affairs of the province, and that year sent for the first time two deputies to the General Assembly, which had been held but twice before, (during the Spring and Winter of 1668). The few accessions made during the five years succeeding 1676-81 may have been caused by the disputed title of boundaries between Piscataway and Woodbridge, and the division of ownership in the colony and the unsettled condition of proprietorship, which was not definitely determined till 1682. Up to this period nearly all the planters had come from plantations in New England or Long Island, and been under the influence of instruction tending to Baptist doctrines. Most all of the first original settlers in Piscataway were imbued with religious principles of this denomination, which had been discernible among the earliest adventurers to New England, and been preached by Hauserd Knollys in New Hampshire and taught by Roger Williams in Massachusetts and Rhode Island, and advocated by William Wickenden among the towns on Long Island. .Several of the Fitz Randolph families made East Jersey their home for many generations. 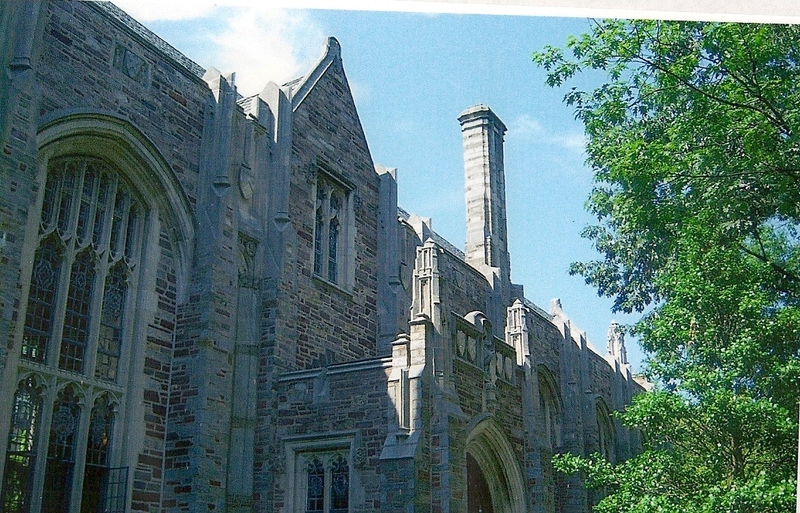 But Benjamin in a few years moved to the site of the present town of Princeton. Our knowledge of his family is entirely due to the records left by his son Nathaniel Fitz Randolph of Princeton. Edward was bequeathed 10 pounds sterling by his father if he came to demand it. Nathaniel became a Quaker, and one of the most influential of the sect. He migrated to Woodbridge township in 1678-9, locating near the Blazing Star ferry. He was the father of eight children, and a man of remarkable usefulness and importance in the commonwealth, filling all the local and county offices and prominent in the colonial government. His brothers, John, Joseph, Thomas and Benjamin , had moved to Piscataway ten years earlier- in 1668-9 and were all Baptists except Benjamin. The emigration of this family to New Jersey was prompted by the severe enactments of the court of the old colonies, prohibiting the free exercise of individual consciences, compelling every person to sustain by tax the established Church worship, and imposing banishment upon any who opposed infant baptism. Nathaniel and his immediate descendants were the only members of this prominent family belonging to the Friends. It is thought Nathaniel joined the Society at his marriage in 1662.He suffered persecution from Plymouth government and was fined 10 pounds (1663) & 2 pounds, 2 shillings (1669) by Plymouth court. Before 1677, he received a severe beating from Puritan neighbors after a religious argument and that same year he exchanged house in Barnstable for land in Woodbridge, NJ. He was succesful in New Jersey serving on the Vigilance Committeeman, Assoc Justice & High Sheriff of Middlesex Co, NJ, State Assemblyman, Overseer of Highways, Woodbridge Town Committeeman. Before 1713 he was a patentee of 590 acres of land in Middlesex Co, NJ. In 1704 his house was opened for weekly meetings of the Friends. He died in 1713. His descendants have married with the Hulls, the Kinseys, the Hartshorns, the Hamptons, the Marshes, the Vails, the Laings, the Websters, the Shotwells and the Smiths. The Woodbridge meetings, except two, (held at John Kinsey’s in November & December, 1707) continued from this time forward to be held at the house of Fitz Randolph until the Friends had completed their meeting house, in which the first session was held September 19th, 1713. We cannot tell where Fitz Randolph dwelt; hence we cannot designate the locality where the Quakers met, for so many years, in harmonious council. Nor are we wiser in regard to the house of Benjamin Griffith where the first Quaker meeting in the village was convened. In 1707 we find the latter spoken of as an inhabitant of Amboy, from which we infer that he had returned to that place, although he attended the Woodbridge meetings with unabated interest. It may not be out of place to state that some well-informed people believe Nathaniel Fitz Randolph’s residence to have occupied the site of the building which was the property of the late John Barron, near the depot on Green Street. On the 18th of August the building of a Meeting-house was again discussed, John Kinsy offering a plot of ground for the purpose. Kinsy’s offer was not accepted on account of the inconvenience of the locality in which his land lay. It was resolved, however, to select a suitable place. In September, Nathaniel Fitz Randolph reported that no eligible spot had been heard of; but in October he stated that a man willing to sell a desirable piece of ground had been found. He was authorized to effect the purchase of it. On the 21st of January, 1706, he informed the Friends that the land, comprising of half an acre, could be obtained for six pounds. 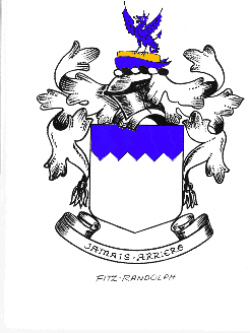 The meeting approved the proceedings of Fitz Randolph, and he was directed to make the purchase in his own name. A subscription of eleven shillings and six pence was paid, which was swelled at subsequent meetings to the full amount required. William Sutton, being about to remove from Piscataway to Burlington, on the 15th of June donated a year-old steer “towards building [the] Meeting-house.” The animal was taken to be “wintered” for 6s. by Thomas Sutton, son of William, by order of the Friends. At this date the land in question had been laid out by Nathaniel Fitz Randolph and John Allen; and a deed was written by the Clerk, Benjamin Griffith, by which the land was held in trust for the Quakers by Fitz Randolph and John Kinsy. John Allen, formerly minister of the Woodbridge Town Church, was the man from whom the plot was bought , the said Allen owning considerable property about where the Methodist Episcopal Church now stands. Many of our Woodbridge readers remember the Friends’ burial place recently occupied by the lecture-room of the Methodists; but few, if any, are aware that a Quaker Meeting House once stood there. Such is the fact, and the history of this ancient building, no trace of which is left, is that which we are now recounting. How soon, alas, perishes all the handiwork of man! This house cost much sacrifice and toil to complete it, as the records show; but what remains, except these yellow leaves, to tell us the struggles of the godly worshipers. May they sleep the sleep of the just in their unknown graves, for the story of their toils is know to One who giveth rest to His beloved. Mary’s husband Samuel Hinckley was born 24 Jul 1642 in Barnstable, Plymouth Colony. His parents were Samuel Hinckley (b: 25 Jul 1587 in Harrietsham, Kent, England) and Sarah Soule (bapt. 8 Jun 1600 in Hawkhurst, Kent, England. He first married 14 Dec 1664 in Barnstable, Plymouth Colony to Mary Goodspeed (bapt. 2 Sep 1647 in Barnstable – d. 20 Dec 1666 in Barnstable, Barnstable, Mass) Samuel died 2 Jan 1727 in Barnstable, Massachusetts. Samuel’s brother Thomas Hinckley (wiki) was the Governor Plymouth from 1680 to its merger with Massachusetts in 1692.
i. Samuel Hinckley b. 6 Feb 1669 in Barnstable, Barnstable, Mass. ii. Isaac Hinckley b. 20 Aug 1674 Barnstable, Barnstable, Mass. iii. Mary Hinckley b. May 1677 Barnstable, Barnstable, Mass. iv. Mercy Hinckley b. 9 Apr 1679 Barnstable, Barnstable, Mass. v. Ebenezer Hinckley b. 2 Aug 1685 Barnstable, Barnstable, Mass. vi. Ichabod Hinckley b. 1686 Barnstable, Mass. John’s wife Sarah Bonham was born 16 Feb 1664 in Barnstable, Barnstable, Mass. Her parents were Nicholas Bonham, (1630 -1684) and Hannah Fuller (1636 -1683) Sarah died 16 Jan 1738 in Belvedere, New Jersey. John was a constituent member of the First Baptist Church of Piscataway and one of the largest landholders in the township. Thomas’ wife Elizabeth Manning was born 1669 in Piscataway, Middlesex, New Jersey. 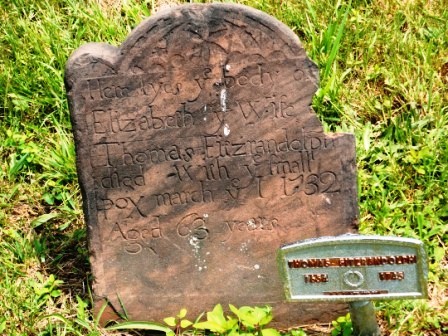 Her parents were Jeffrey Manning and Hepzibah Andrews (b.1645 – ) Elizabeth died 1 Mar 1732 in Piscataway, Middlesex, New Jersey. She died from Small Pox, along with her daughter Elizabeth (Mar 19) and a grandson (Mar 21) within weeks of each other. All three are side by side in the Fitzrandolph family plots, and died within three weeks of each other. Thomas was Clerk of the township and one of the first group of Selectmen to manage the affairs of Piscataway, and served as deputy in the General Assembly. vi. Dinah Fitz Randolph b. 10 Jul 1700 in Piscataway, Middlesex, New Jersey; d. 1775 and may be buried in Bethlehem, Hunterdon County, New Jersey? Ezekiel was called “youngest son” in the will of his father, and he received land and personal property in the will of his brother Thomas. 1 Jan 1687 – Ezekiel Bloomfield was elected a Deputy to the Colonial Assembly January 1, 1687. 20 Apr 1694 Recorded May 28, 1694. Deed. Ezekiel Blumfield wheelwright, to John Loofbourrow, miller, both of Woodbridge, for 25 acres of meadow, N. the Great Pond, W. meadow, sold by John Blomfield to John Barclay, S. and E. grantor’s meadow. i. Timothy Bloomfield b. 11 Feb. 1681; d. After 20 Sept. 1748 Woodbridge, Middlesex County, New Jersey; m. 2 April 1707 in Woodbridge to Rose Higgins. Timothy married only about three months after the death of his mother. His father was already dead. Did he take in some of his younger siblings to raise? Is this why he married so quickly, or was he already engaged? ii. Ezekiel Bloomfield b. 26 Nov 1683; d. 14 Jan 1748 Woodbridge, Middlesex, New Jersey; m. 23 Dec 1706 in Woodbridge, Middlesex County, New Jersey to Hester Rolfe (b. 1685 Woodbridge, Middlesex, New Jersey – d. 11 Sep 1742 Woodbridge) Hester was previously married to Jonathon Dunham. iv. Nathaniel Bloomfield: b. 9 Feb 1688 Woodbridge, Middlesex, New Jersey; d. 15 Oct. 1689 at age 1 year, 8 months and six days. Woodbridge, New Jersey. Death occurred only 9 months and 20 days after his sister’s death. vii. Rebecca Bloomfield: b. 1697 Woodbridge, Middlesex County, New Jersey; d. 1757 Woodbridge, Middlesex County, New Jersey; m. ~1715 in Woodbridge, Middlesex County, New Jersey to Charles Salyer, Jr. Were they Quakers? They are listed in an article about early Plainfield Quakers, but it isn’t stated whether they were Quaker, or even lived there. The great grandson was not, so if they were, that ended at least with some lines in a few generations. Benjamin’s first wife Sarah Dennis was born 18 Jul 1673 in Woodbridge, Middlesex, New Jersey. Her parents were John Dennis (1640 – 1689) and Sarah Bloomfield (1643 – 1689) Sarah died 22 Nov 1732 in Stoney Brook, New Jersey. Benjamin’s second wife Margaret Robertson was born 1709 in Princeton, Mercer, New Jersey. Margaret died 1747 in Princeton, New Jersey. Benjamin was taken in as a townsman of Piscataway in 1684. but moved to Princeton in 1696-9 with a colony of Friends whom William Penn induced to settle on a fertile plantation watered by Stony Brook, a tributary of the Millstone River. Benjamin FitzRandolph and Elizabeth Pridemore FitzRandoph left NJ and settled in North Carolina for a while. The N. C. Colonial Records show land grants for him in 1735 in Bladen Co., NC . They lived on the Cape Fear River and was referred to as a “Planter”. He is referenced as “Sr.” in the records , although he was the son of Benjamin of New Jersey who never came to North Carolina. This reference was most likely because he had a son Benjamin also. At some point Benjamin FitzRandolph and Elizabeth returned to NJ where they died. He was appointed POA for his brother- in-law, Ephraim Manning who had returned to NJ about 1739. The four and a half acres of ground given by Mr. Fitz Randolph for the site of the College adjoined his own residence on the King’s Highway, now Nassau Street and the Lincoln Highway, behind which was the family burial ground. When Holder Hall was erected on this site in 1909, mo less than thirty-two tombs were discovered, one of them being that of Nathaniel Fitz Randolph. Ironically, Holder Hall, built over Nathaniel Fitz Randolph’s grave is named for another of our Quaker relatives, Christopher Holder. Nathaniel FitzRandolph, a Quaker, was primarily responsible for raising the money and securing the land required by the trustees to locate the College in Princeton, which they did in 1756. He was a large land owner in and about Princeton, and one of its prominent citizens. A number of other locations for the college of New Jersey were considered. New Brunswick was more favored than any other site by the Trustees, but Fitz Randolph by his energy fulfilled the monetary requirements for the location of the college, where others failed, and won the prize. The citizens of Princeton complied with the trustees’ request to raise £1,000 (actually they raised £1,700), provide ten acres of cleared land for the campus and 200 acres of woodland for fuel. FitzRandolph himself donated £20 and 4.5 acres of land. According to legend, an agreement between Nathaniel FitzRandolph and the College of New Jersey (as Princeton was then known) was made in 1753. 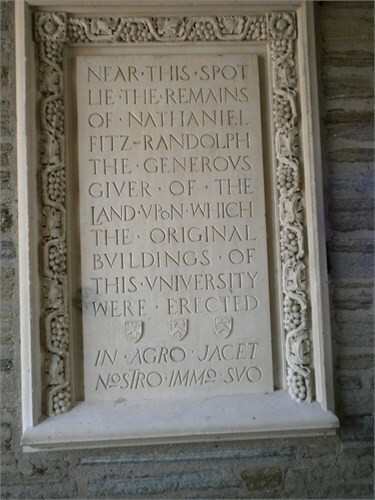 In exchange for donating the land on which Nassau Hall now resides, the College agreed to pay tuition for all of his descendants to attend the institution. Unfortunately, this is not true. No such provision was incorporated into the deed of gift. “When it was reported that a Charter was granted by Hamilton our Deputy Governor for a college to be erected some where in New Jersey, & twelve trustees appointed, I was the first man that proposed to set subscriptions on foot Sd Tower, also I was the first man that drew a subscription for that purpose, also the first man that rode to obtain subscriptions, also wrote twenty papers for that purpose, and helped to spread them. And did obtain about five hundred Pounds as subscriptions under sd Charter. Also after a second Charter was granted by Gov. Jonathan Blecher for a College in New Jersey and twenty five trustees were appointed, the old subscription was dropped. And I wrote about fifteen subscription papers more, helping to spread sd subscription papers in which about seventeen hundred Pounds was obtained. Nathaniel Fitz Randolph was the author of the “Book of Records,” now in the possession of Princeton University, which gives an account of the branch of the Fitz Randolph family to which he belonged. In 1905 the FitzRandolph Gateway was erected through a bequest from Augustus van Wickle in honor of his ancestor Nathaniel FitzRandolph. 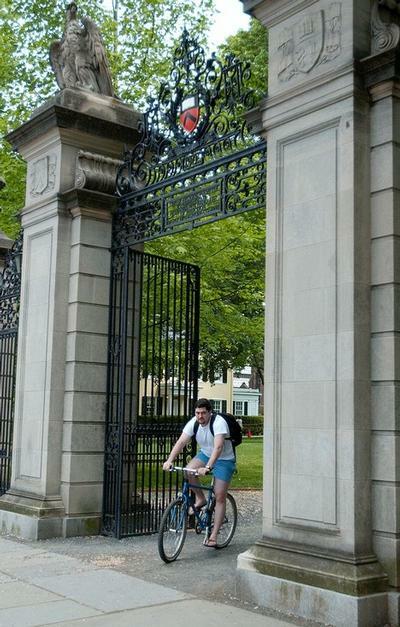 This gateway adorns the main entrance of the campus from Nassau Street. The myth surrounding Fitz Randolph Gate prevents most students from venturing out the main exit. The FitzRandolph Gate was initially constructed to keep townspeople off the University campus. It was built in 1905 and kept closed and locked, except during the Parade and graduation. The graduation march through the gate, which is still observed, symbolizes the graduates’ transition from the University into the larger world. The gate was also opened occasionally to honor notable visitors. For example, President Grover Cleveland passed through the gate during his visit to campus. In 1970, the gate was permanently cemented open, at the request of the Class of 1970. This gesture was intended to reflect improving relations with the town. The opening also embodied a greater significance. Given the student uproar over Vietnam and Cambodia, it was an attempt to symbolize that Princeton was open and responsive to the world, and not just a cloistered ivy tower. Since 1970, the gate has remained open for regular use. However, the superstition that emerged shortly after the opening has caused some students to avoid the gate. According to the myth, students may imperil their graduation by exiting the gate towards Nassau Street. While entering the gate is apparently safe, some students still take extra precaution. “I know people that won’t walk in the gates,” said Emily Moxley ’05. “I always laugh at them when I walk in and they take an extra minute or two to go to one of the side gates. Some alumni are still quite serious about observing FitzRandolph protocol. Michelle Yun ’06 visited campus as a pre-frosh with Thomas F. Schrader ’72. At the time, she was not aware of the myth and nearly walked out of the gate to take a photograph. “Mr. Schrader jumped up . . . and grabbed me with both arms, pulling me back suddenly,” she said. Since the incident, Yun says she will not enter or exit the gate and will not permit anyone walking with her to do so either. This entry was posted in 12th Generation, Dissenter, Historical Church, Historical Monument, Historical Site, Immigrant - England, Immigrant Coat of Arms, Line - Shaw, Pioneer, Place Names, Royal Ancestors and tagged Barnstable, Piscataway, Scituate Pioneer, The Arabella 1630. Bookmark the permalink. What a great site! I am in awe of your talent. I am an 8th great-granddaughter of Edward FitzRandolph “the pilgrim” through my mother’s great-grandmother’s Bennett line. Caroline Collins Bennett Ray (Mrs. James Ray) was a daughter of Benjamin Bennett who was born in NJ to Michael Bennett and his wife Charity FitzRandolph who were married in Burlington County, NJ, in 1774 and migrated to VA and then GA shortly after the American Revolutionary War. Michael Bennett was in the NJ militia in a company headed up by his future wife’s cousin. I am still hoping to hire a CG to research NJ records for primary documentation of Charity FitzRandolph’s parentage. Family records show that her father was Benjamin FitzR. and her mother was Elizabeth Haywood but, as you know when applying for membership in any organization, primary documentation is required. I do have a copy of an indenture from Monmouth County showing that right before Charity FR Bennett died in GA in 1807/08 she and her husband Michael Bennett were in the process of selling land in Stafford Township to a William Griffith of NJ. That sale was finalized about 1809 with proceeds being distributed among their children. Thank goodness names of adult children were listed in the final papers. Basically, need to know who left the land in NJ to Charity. If you know of a great researcher in NJ whom I can hire to fill in the “blanks”, I would appreciate any information. You can pass my email to that person, and maybe I’ll get lucky and he/she will have time to help me. Many thanks and again a very informative site! I also have copies of those land records and they do state that a Benjamin FR is her father. With the names of the other siblings and uncles indicated whose relationship to Benjamin FR/Elizabeth Haywood is known, it is fairly certain that Charity’s parents are actually Benjamin FR and Elizabeth Haywood. Thx for your reply. I am very slow checking my emails. Rely on my husband too much to do that for me. I have a request in to the President of The Fuller Society of the Descendants of the Mayflower. She lives in New Jersey and am hoping she can recommend a topnotch researcher of NJ records. The deed I have does not mention a parent/father of Charity FitzRandolph Bennett; however many sites list her as a daughter of Benjamin FitzR. I am hoping Benjamin had a will listing his children and their respective spouses and where the adult children resided. I believe the land that Charity and Michael were in process of selling to a William Griffith of NJ was land she had inherited. As I acquire primary documentation, I will pass on to ‘cousins’ that I correspond with. I may have to hire a genealogist from my area to make the trip to NJ to research Benjamin and his wife Elizabeth Haywood in order to tie them to the Charity FitzR. Bennett (Mrs. Michael) who immigrated to GA and died in Oglethorpe Çounty about 1808. Do you have a site such as ancestry.com that you have copied land records into that can be accessed so that I can make my own copies and/or check to see if those are the records that I have found online? Also, if you find any obscure sites that have info that would be helpful, please email me. Just noticed your hometown is Union Parish, LA. Couple years ago I was on DAR site for members and saw info on couple ladies who were living in your area who had used a son of Joseph Watters (father of my Benjamin Bennett’s second wife Susan Watters) to obtain membership in DAR. Hopefully, I will be able to use Joseph Watters, militiaman in NJ, as supplemental DAR ancestor. The Watters and the Bennetts supposedly knew each other in NJ prior to and during the American Revolutionary War and traveled together to VA and then on to GA. Have no idea about the timeframe of this travel. I believe the county in Virginia where they reposed for a few years was Culpeper but don’t quote me on that. I am descended from Andrew Wooden and Elizabeth Fitz Randolph and was wondering what the source of Andrew Wooden’s parents (names and dates) was. I was wondering why the author Douglas Richardson has dropped Edward ‘the pilgrim’ FitzRandolph from his latest book on Magna Charta Sureties (published 2012 – however not sure of this date). I know there is doubt about the direct relationship between Gen 10 to Gen 11 (John FitzR to John FitzR) in Frederick Lewis Weis and Walter Shephard’s _Magna Charta Sureties 1215_. 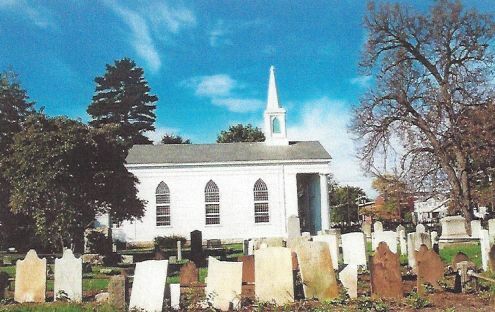 I am working on my connection to Edward ‘the pilgrim’ through a Charity FitzRandolph who married Michael Bennett in 1774 in Burlington County, NJ. Some sites imply that she was the daughter of Benjamin FitzRandolph and Elizabeth Haywood/Hayward (day. of James) and other sites do not list her. Would be a great help if someone can suggest a very good researcher in New Jersey or someone who lives in another state in New England. Thanks for any help a Miner family researcher or any other researcher can supply. information. He was a first cousin of my grandfather, FitzRandolph Stout. Theodore, Governor of,1869-72, and later United States Senator from New Jersey, 1875-81 ; Joseph 1st and Joseph 2nd both in House of Representatives from New Jersey early 19th century. Most famous descendant of Edward FitzRandolph through his mother’s Dunham family is President Barack Obama. If anyone is interested in joining the Society of Descendants of Lady Godiva on this line, please visit the Society of Descendants of Lady Godiva at societyofdescendantsofladygodiva.com, or email me at DavineR@aol.com.